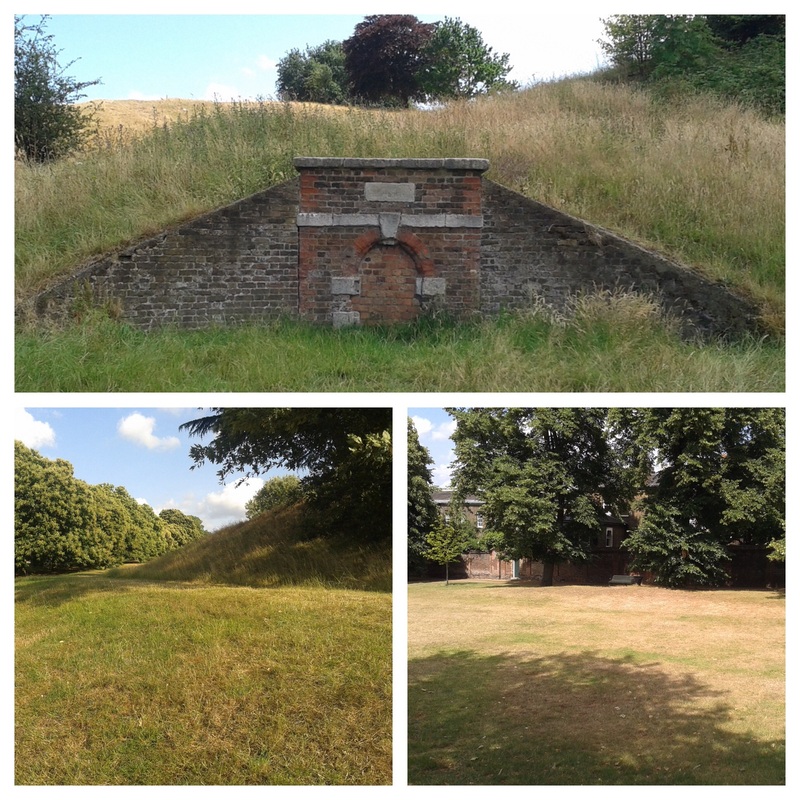 One of the more noticeable features in and around Greenwich Park is a series of (mainly red) brick structures which are clearly several hundred years old – the biggest and most obvious being a large windowless chapel-like building on the western side of the Park at the bottom of the escarpment, close to Crooms Hill. They are all the external remains of a system of conduits, underground tunnels, which brought fresh water from Blackheath to the Royal Hospital for Seamen at Greenwich. While there seem to have been earlier conduits for the former Royal Palace (that was previously on the same site), the visible remains date from the late 17th and early 18th centuries. It has been suggested by Per von Scheibner, that there are at least 12 conduits from this era around Greenwich – although some of these may have fallen into disuse quite soon after construction. There are elements of three that are clearly visible in the Park. 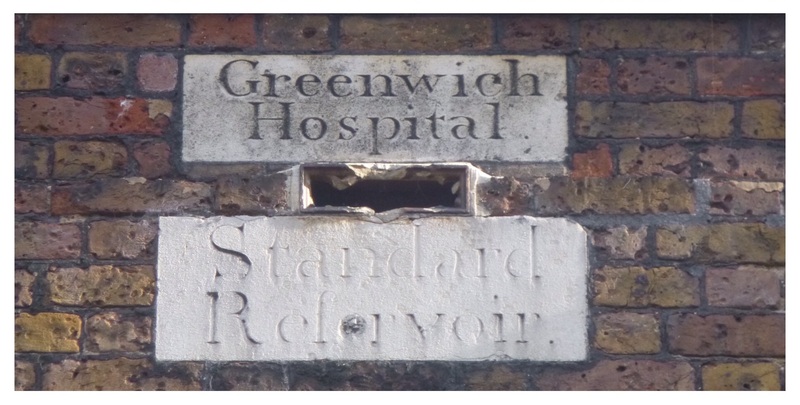 The chapel-like structure is the most obvious element and has a plaque describing it as “Greenwich Hospital Standard Reservoir” and is Grade 2* Listed. It is generally known as the Standard Reservoir and was probably designed by Nicholas Hawksmoor, who was Deputy Surveyor of Works in Greenwich at the time – he is better known for churches like St Alfege in Greenwich and St George in the East. The other end of the conduit is to the south-west of the Park on the edge of Blackheath – Conduit Head which is on the corner of Hyde Vale (originally known as Conduit Vale) and West Grove. The information panels at the semi-cylindrical Head and the surface brickwork that feeds it date it from around 1710. The conduit would have taken water to the Standard Reservoir. To confuse matters there is another conduit, the Standard Conduit, which also had a small reservoir, immediately above Hawksmoor’s building. Both of these are marked on the 25” OS 1st edition map, surveyed in 1867, along with rows of trees either side of them known as Conduit Avenue – the avenue extended from around where the Rose Garden is currently situated to the bottom of the Park, close to the herb garden – it is very clear below the escarpment. 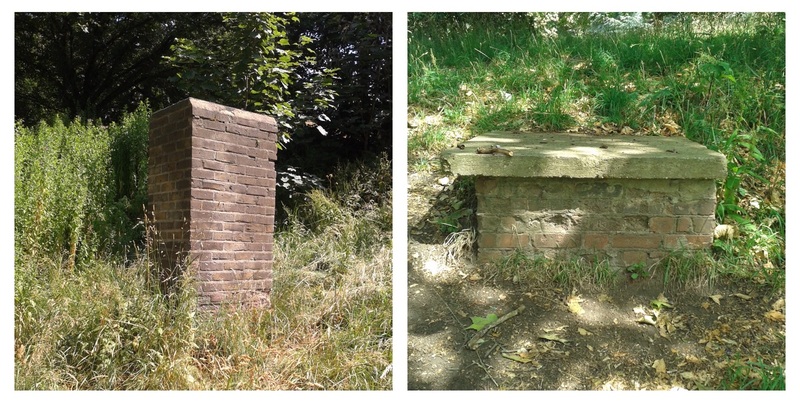 From the middle of the escarpment down, along the course of Conduit Avenue, there are a series of other signs that indicate the presence of conduits – several bits of raised brickwork and a number of otherwise unexplained manholes. 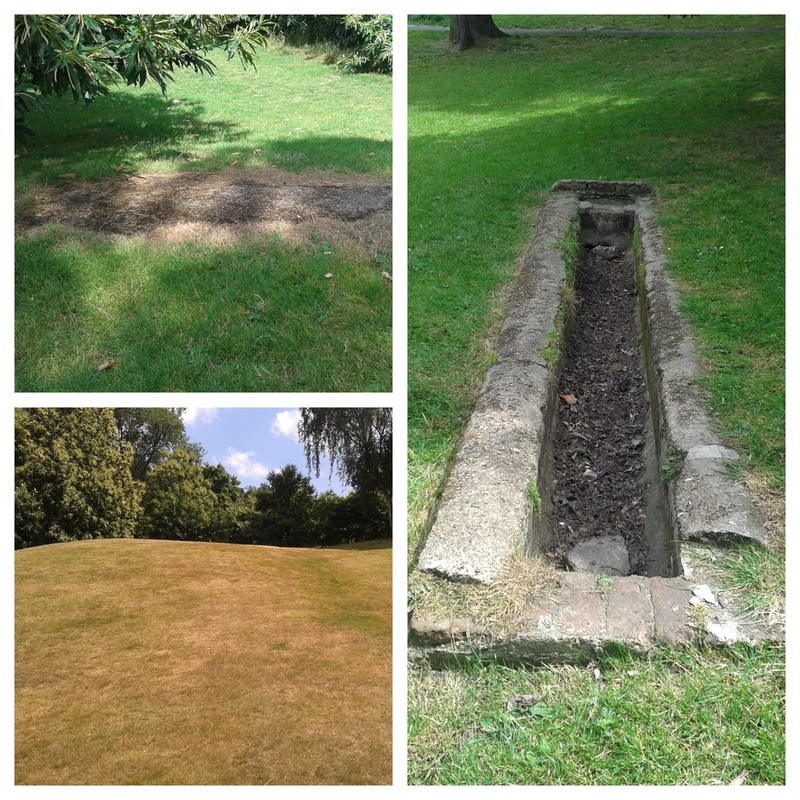 In the centre of the Park, close to Queen Elizabeth’s Oak, there is an exposed stonework gulley, which looks very similar to that on the edge of the heath, and is a remaining part of another arm of the conduit system in the Park. Just below it and a little further down the hill are undoubtedly some other remains – a bit of pipework on the surface, a number of manhole covers and some earthworks around the final manhole – perhaps there used to be a conduit arch there. Above the exposed stonework, there was probably a small pond or reservoir – there is small, flattened area, carved into the top of the escarpment – similar to those on the flanks of One Tree Hill which we’ll now move on to. 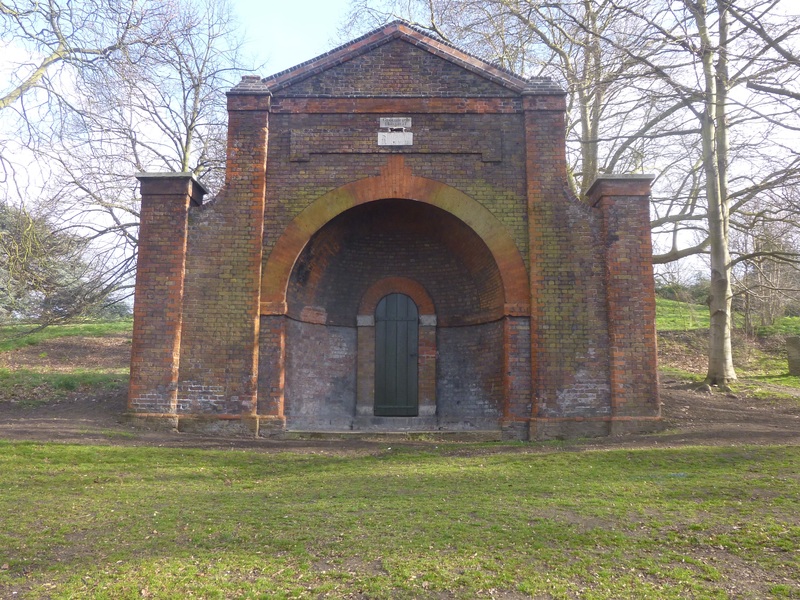 To the west of the Park there is a conduit arch at the foot of One Tree Hill which is thought to have been built in 1705, probably by Hawksmoor. The tunnels behind it were found to be inaccessible when surveyed in the mid -1990s; however Subterranean Greenwich managed to gain access, with some great photos. There were certainly more visible above ground remains in the 19th century – OS Map surveyors noted ‘water receivers’ to the east of the arch on the 1867 surveyed 25” map. A little lower down the hill, nearer to Maze Hill, used to be a pond that was part of the conduit system – the location though is obvious on the ground – a flatter area, banked at the bottom carved out of the lower slopes of the Park. There are other possible signs of the remains of the conduits in same area – around the eastern flanks of One Tree Hill there is what looks like a slightly raised track going up the hill (which has a couple of manhole covers), toward the top of which it has clearly been flattened out – perhaps there was originally another pond or open reservoir here. It would certainly have been in the right area based on a map found by Subterranean Greenwich – more on them later. built of brick, and are generally about 4 to 6 feet high and about 2 feet to 4 feet wide and generally run between mere inches to some thirty feet or more below ground level. At the top is a rounded or Gothic arch. At the bottom of the conduit walls are gaps in the brickwork to allow water to feed into the conduit. 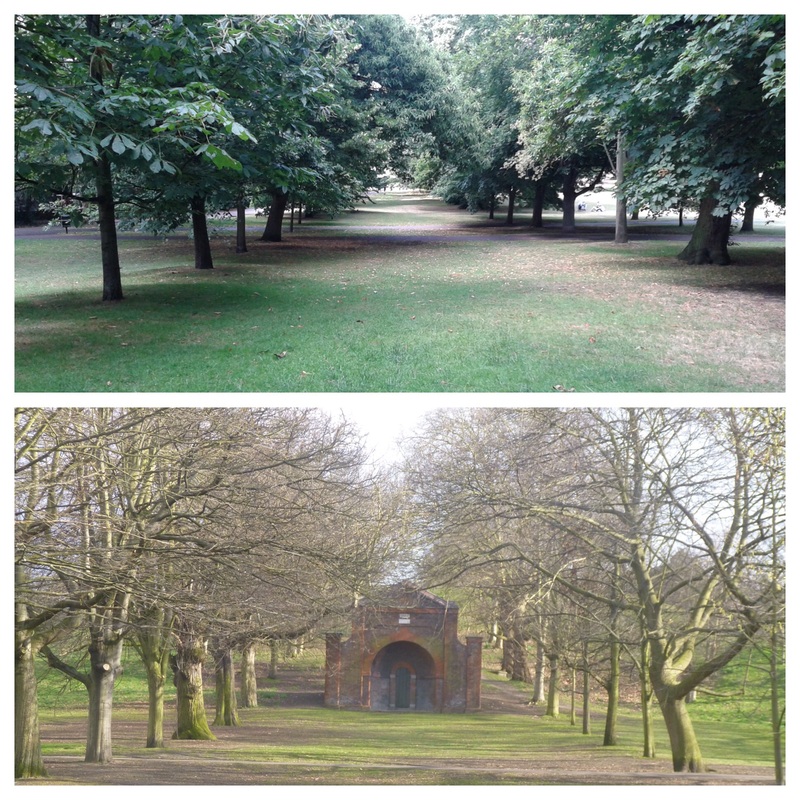 The conduit system largely stopped being used when the now redundant reservoir was constructed between 1841 and 1844 close to Great Cross Avenue on the western side of the Park. As a result many of the conduit heads and other above ground evidence was demolished in the second half of the 19th century. There is a fascinating resource with an enormous amount of information on many of the things covered in this post and on all things below the surface in SE10 and slightly beyond – Subterranean Greenwich (which migrated to WordPress earlier in the year). This covers the conduits in much more detail, including a lot of the underground aspects of them. This entry was posted in Blackheath History, Greenwich History and tagged Conduit Head, Greenwich Hospital Standard Reservoir, Greenwich Park, Hawksmoor, Standard Reservoir on July 15, 2015 by Paul B.
Pingback: Lunamag.com | The leading children's fashion & family lifestyle magazine you need to read!